America’s founding fathers created a system of checks and balances that would, above all, preserve political moderation from the wild-eyed fervor of democracy. There is a certain advantage in the American political system to being a moderate. Meanwhile, polarization is blamed, with a good deal of truth, for much of the gridlock and mudslinging in modern politics. That being said… I am not, never have been, and never will be a moderate. Politics is dirty business. It’s only worth engaging in because at the end of the day, the results of politics, can mean poverty or prosperity, dignity or despair, and even life or death for people in our communities. If we have liberty or equality or basic human rights today, it’s because good people decided politics shouldn’t just be left up to those who are in it for their own fame or fortune. My existence is the result of a history of politics. The fact that I can afford an education, the fact that I have a weekend off work to write this, the fact that my mother was able to become a professional who could raise two children on her own, the fact that my ancestors stopped being excluded from immigrating to this country, is all because some good people engaged in politics and fought the entrenched interests of the status quo. It is absolutely not because of moderates. It is because there were brave people who were willing to take a stand, even if it was controversial. People who believed in justice, who believed in compassion and tolerance for other human beings, people who believed in giving everyone the opportunity to succeed, and in a basic standard of living for all human beings. People who felt without doubt that the way things were in their society was undeniably wrong and refused to accept it. In a time when in the name of austerity, we are cutting away at those ideals, lying the burden of balancing government budgets on children, on the disabled, on women, on the poor, on the elderly, in order to maintain low taxes on the rich and wars overseas, I cannot be a moderate. Simply because there are people out there who are saying something, does not mean that they are in some way also equally right. There were people who said that the freeing of slaves in this country would collapse our economy, who said that giving women the right to vote would destroy our democracy, who said that the government had no business helping poor kids go to school instead of work in the factories. What did the moderates say then? They insisted that both sides just weren’t listening to each other, everyone was at fault for being so polarized, and that we should look at both sides of the issue and weigh them equally. 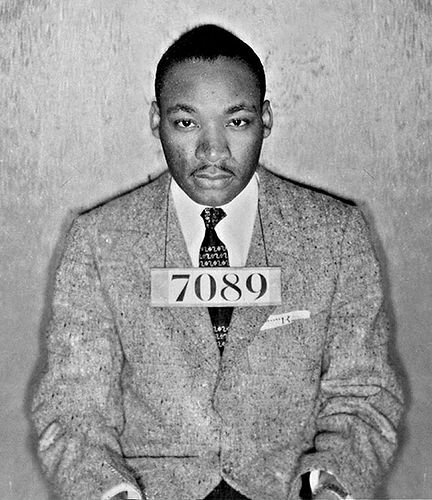 Martin Luther King Jr. said that the arc of history is long, but it bends towards justice. I believe that. It doesn’t bend though, without a lot of pulling. There are those who don’t want that arc to move an inch. And there are moderates who simply follow wherever the arc happens to be, at the place and time that they are living their lives. And then there are those who are doing the pulling, the straining, the backbreaking work of bending that arc in the right direction. History will not remember as heroes those who urged us to split the difference 50/50 and call it even. I understand that there is an inherent urge in human beings to not rock the boat, to not have to do anything controversial or which powerful people or some large portion of the population might be angry about. That urge stays constant throughout human history, only changing its political platform to accommodate the changing winds of society’s new norms. It is the same urge that made some of us 3/5th human under federal law. It is the same urge that today does not question the constant string of attacks on the poor, on workers, on the elderly, on students, on immigrants, but simply disagrees with the extent of those attacks. I can think of lots of things that are always better in moderation: alcohol, hot sauce, makeup, the list goes on. But compassion and tolerance are not on that list. They are not better in moderation; they are better loud, unapologetic, audacious, and bold. The gap between rich and poor has risen to historic levels, as corporations are taking in record profits while demanding that restrictions and taxes on them be stripped away at the expense of workers and the environment, as our county is strewn with families kicked out of their homes and out of work while the “political capital” to help them seems nowhere to be found, let alone to stop ourselves from baking the very planet we live in. I believe, from the bottom of my heart, that this is a time of great moral conflict. That is why I am not a moderate. I am, however, a pragmatist. There is a difference. I think that many people I know who see themselves as political moderates are actually what I would call pragmatists. A pragmatist puts results over dogma, victory over philosophy. I realize that in a democracy, not a dictatorship, there is no use in intellectual speculation about what the world would be like if I had my way. I don’t. I have a blurred vision of a better world than the one I live in, and I would like to win a few small but significant battles in my life to move reality in that direction. A moderate views unconditional compromise as the ideal outcome. A pragmatist views compromise as a means to an end, and only does it in order to get something in return. A pragmatist is willing to gain ground towards progress and justice bit by bit, but is never satisfied. A moderate wishes only to stand on whatever ground happens to lie in the middle. I believe that most of human history has been a long, slow struggle for progress against powerful forces of greed and intolerance, and that this struggle continues today. And I’ve read my history and I know which side I’m on. So here’s to a life fighting the good fight. Hope I win a few. Will the Revolution be Strategized?